Use the search engine to find the best place to discard all types of waste and locate the waste containers around the city. 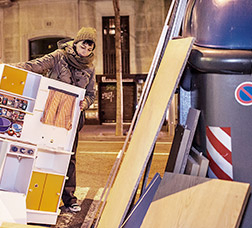 Use the Barcelona disposal of junk and old furniture service: it is a free weekly service. Look up the day and time that corresponds to your street. 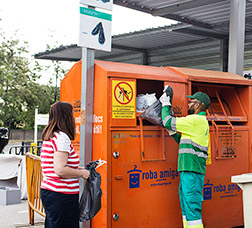 Recycle your clothes in Roba Amiga's orange containers, or take part in our municipal clothing-exchange programmes and help to foster responsible consumerism and prevent waste. Around the city, you’ll also find disposal points for materials like debris, asbestos cement and plant waste. 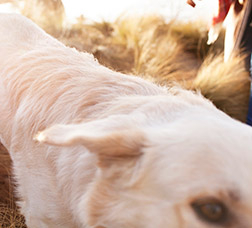 The immediate disposal of dead animals (dogs, cats, pigeons) that are in the street or in a private home is a service addressed to both residents and companies. Find out how it works. Household Waste and Recycling Centres (green points) are where waste is taken that must not be thrown away in the containers in the street. Locate green points and find out about the different types that exist: Green point of zone, Green point of neighbourhood, mobile Green point, and mobile Green school and electric point. The City Council is launching an awareness-raising campaign, as part of the “Zero Waste” initiative, to improve organic-waste collection in Barcelona’s neighbourhoods. 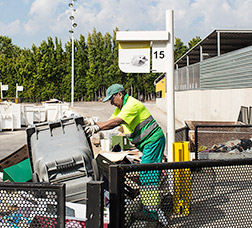 Barcelona is committed waste prevention, reducing waste generation, reusing waste and selective-waste collection. Find out all about it. Barcelona has a network of pollutant monitoring stations, which enable you to consult the air quality in your immediate surroundings, in real-time. Look them up on the air quality map. Web portal containing information about how we can save energy, contract it or generate our own, to progress towards a more sustainable energy model. Find out about Barcelona Energia too, the publicly owned metropolitan electricity distributor which will be extending its services to citizens in 2019. Discover the projects, policies and initiatives being implemented in Barcelona for combating and responding to the effects of climate change. On the Strategic Noise Map, you can check out your noise exposure levels according to the acoustic situation of your street. Check out the initiatives under way in Barcelona to make the city more sustainable. Want to help?